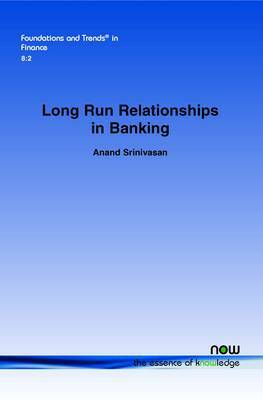 Long Run Relationships in Banking analyzes the effects of long run relationships in banking between corporate borrowers and lenders. The first part of the survey starts by briefly reviewing theory on bank relationships. While the second part is focused on statistical issues in quantifying the effects of relationship banking, and analyzing various empirical biases that are likely to arise when using common proxies for relationship banking. The author also analyzes the impact of competition on relationships, and reviews the evidence on direct importance of soft information in lending providing a validation of the continued specialness of banks. Long Run Relationships in Banking is organized as follows. Section 2 briefly reviews the theoretical arguments for the prevalence of long run relationships in banking. Section 3 reviews evidence on the ways in which relationships add value. Section 4 critiques existing empirical approaches used to measure relationship banking effects, focusing on the validity of the commonly used empirical proxies to capture the underlying economic constructs of relationship banking. Section 5 surveys the burgeoning literature on hold up (switching costs) of borrowers by banks that circumvent some of the empirical issues raised above. Section 6 examines the motivations for firms to engage in multiple banking relationships that are not related to circumscribing the rents arising from hold up. Section 7 examines the impact of competition on relationship banking. Theory and empirical evidence suggests a complex relationship between the two. Section 8 reviews more direct evidence on the importance of soft information in relationship banking, and Section 9 concludes with directions for future research.